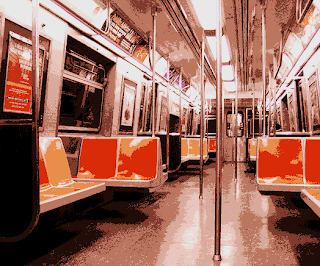 NEW YORK, NY - (@The Comedy News) - Today on the morning rail commute, a tall, dark-haired guy sitting across from Anna Silberman began to stare at her for a good fifteen seconds. Anna thought to herself, "he's kinda cute, I give him a seven-point-five out of ten. But... aww no, he's still staring, now I give him a seven. No, six." A moment later Anna's inner monologue evaluated the guy again, "Four. He's a four. Cute but a creeper." Anna sighed. In an instant, the creepy guy stood up and walked towards Anna. "Oh no, please don't talk to me, please don't talk to me, please don't talk to me," Anna thought. "Hi I'm Benji," the creep began as he sat down next to Anna. "Oh no!" Anna screamed internally. "I was just wondering," continued Benji. "Does this jacket smell like cabbage?" "Eww, what?" Anna responded as she reached for her pepper spray. "You see," Bejji said. "I bought this jacket last month when I was in Israel, and last Friday, I left it hanging at coat check at a Shul in Yonkers, and I'm convinced that the jacket smells like cabbage now." Anna put her pepper spray back in her purse. "Were you on Birthright?" Anna asked Benji as she began to re-evaluate him. "Jewish, bold, self-conscious. That's kinda cute. Six-point-five..."
Benji eagerly answered, "Yeah, most inspiring trip ever! Have you been?" "Yes! Twice last year!" Anna rejoiced. "That's hot, I've been meaning to go back to Israel all year, but I have been doing so much traveling to visit my brother who just became a Rabbi in Paris." "Oh my God, eight. I'm interested! Wait...NINE!" Anna made her final evaluation. Benji and Anna exchanged contact information. They will be expecting their first child at the end of February 2014.